The famous sandwich from New Orleans is a real feast! You can have it as lunch, dinner or finger food at your parties, in small cuts, it is always a success! I had this in mind since a while, and a wonderful ciabatta loaf, sitting on my kitchen counter was to much to bear! After a quick inventory in my refrigerator, I had a bunch of ingredients required except the famous Olive Salad!!! Luckily I found a great store bought Olive tapenade (which is not the really thing, but you do what you can when really hungry or fixed on a recipe, right?) plus some good leftovers from the spicy tomato relish prepared for the Eggs Mexicano. The ciabatta bread pushing me to fill it, what can I say? et Voilà!!! My homemade version of muffaletta!! Slice the loaf in half lenghtwise. Open the sandwich, remove some doughy if necessary. Spread each side with the green olive tapenade, add a little more on the bottom side, then alternate starting with the culatello, add provolone, then mortadella and /or ham, mozzarella or American cheese, Genoa Salami, the tomato relish finally top it with bread slice. In fact fill it at your pleasure! Wrap it in plastic paper and let the sandwich to slowly absorb all the flavors. You could quarter it and serve it now. It is extremely good like that. I know that it’s served cold in New Orleans, but I love warm sandwiches, so while the sandwich is sitting, flavoring up, warm your sandwich press, than grill it like a wonderful Panino!!! Eat it warm, standing, walking, sharing or sitting with your best soft drink or a glass of red wine!! Delicieux (yes it is New Orleans after all! 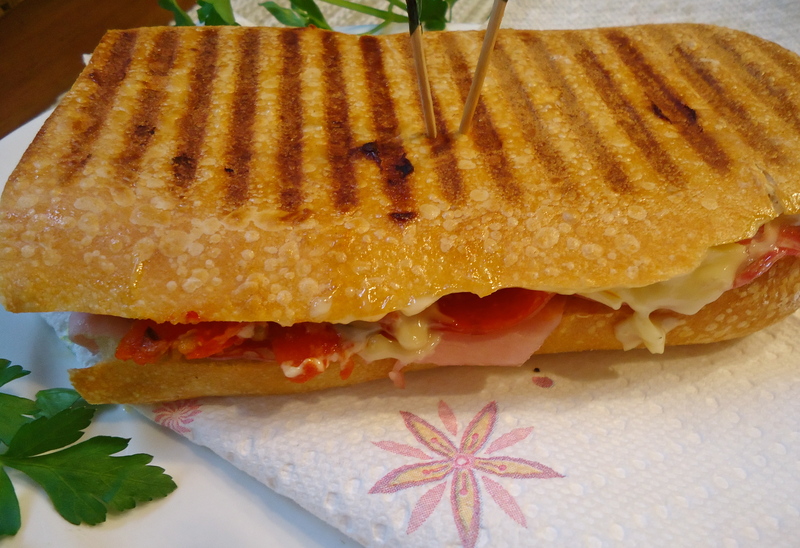 ), delizioso, delicious! !